Now that summer has come to a close it’s officially time to start celebrating fall! Fortunately for all Long Islanders, there are plenty of festivals in the next few weeks where people can enjoy the changing of the seasons. If you’re on the lookout for some fun fall festivals, take a look at this short list that our staff at Westbury Toyota has put together. We’ve picked some of the best events that Long Island communities have to offer, so we know you’ll find one or two that have exactly what you’re looking for as you set out to welcome in the fall season. For Halloween lovers, Spooky Fest is an event you just can’t miss. Taking place at the Tanglewood Preserve in Rockville Center, Spooky Fest occurs over seven different days in October, which means you’ll have multiple opportunities to pay it a visit. There are sixteen acres of Halloween exhibits, walking trails (both scary and not), and festivities to participate in, complete with special effects and all kinds of haunted decor. This is a perfect festival for everyone who enjoys the scariest time of year. If this sounds like the ideal seasonal event for you, your friends, or your family, take a look at the official website to get more details. This fall harvest festival has plenty to do for all age groups. 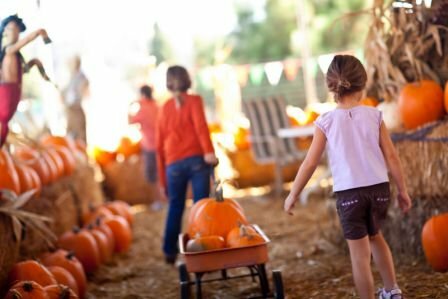 You, your friends, or your family can take part in rustic activities like pumpkin picking, animal feeding, and hay rides. Additional children’s events include magic shows, face painting, and mini-tractor rides. This event is running for multiple days at the end of September and October, which means you can attend more than once if you’re looking for a multi-day experience! This harvest is a great way to enjoy the beautiful days of fall in a peaceful, rustic setting. Admission is free, although the cost for the “Ride Zone” bracelets have yet to be announced. With so much to do, this is a festival that you and your family can make a full day trip out of. On October 13th and 14th, hop in your car and head on over to Theodore Roosevelt Memorial Park in Oyster Bay for the Oyster Festival. In keeping true to the festival name, visitors can take part in the famed oyster shucking and eating contests, but there’s plenty more to do aside from that! You can try out some carnival rides, check out a zoo attraction, enjoy some live entertainment, and browse a multitude of vendors. Parking and admission are free for this event, and you can learn more about it here. If you’re looking for a festival that’s great for a family of all ages, Hicks Nurseries Farm Festival should definitely be right up your alley. Open to the public until October 28th, this festival includes hay rides, kid’s workshops, pumpkin contests, fresh apples and apple cider, and much more. There’s no better way to celebrate autumn as a family, so visit the festival’s website in order to learn more. Even though winter’s only a couple of months off, there’s still plenty of time to enjoy one of the nicest seasons of the year. Take some time to explore the events taking place across Long Island with your closest friends and family. We here at Westbury Toyota are excited to check out the events we listed above, and we hope you do too!